Aviation AirCrafts AirPlanes Airports Fighter Jets Tickets Tips Ideas And LATEST AIR TECHNOLOGY RUMORS , private and business jets much more. 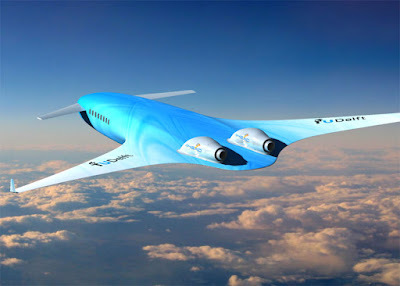 This aircraft would carry 300 passengers over a range of 14,000 kilometres – approximately the distance from Amsterdam (Netherlands) to Perth (Australia). To improve aircraft efficiency and allow for longer flights, KLM's engineering and maintenance department worked with engineers and designers at Delft University of Technology (TU Delft). The result is a design that features two sets of wings – a small pair by the nose and a large set at the rear – that blend into the body. These elements are formed as a single curving shape, rather than attaching the wings as appendages to either side of the plane's fuselage like in current aircraft designs. A recent incident happened on Dubai airport..... It was quite damaging for plane but seems to very funny. UFO Seen Over CHINA !! !